Dr Fleischmann joined the Department as a lecturer in September 2016, having completed her PhD in the Department in December 2015. She is a 2017-2018 non-resident Research Fellow at the International Centre for Non-Violent Conflict. Dr Fleischmann's work looks at the role of social movements, civil resistance campaigns and human rights activism in conflict and peace building, with a particular focus on the Israeli-Palestinian conflict. She aims to understand how activism itself transforms and how it influences the trajectory of a conflict or peace process. 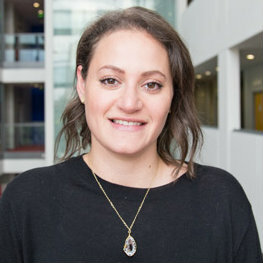 Prior to joining City, Dr Fleischmann taught in the fields of International Politics and International Development at SOAS, King's College London and the University of Roehampton. Aran, A. and Fleischmann, L. (2018). Framing and Foreign Policy—Israel’s Response to the Arab Uprisings. International Studies Review, 0, pp. 1–26. doi:10.1093/isr/viy055 . Fleischmann, L. (2017). Smadar Lavie. Wrapped in the Flag of Israel: Mizrahi Single Mothers and Bureaucratic Torture. New York; Oxford: Berghahn Books, 2014. Peace & Change, 42(1), pp. 162–164. doi:10.1111/pech.12223 . Fleischmann, L. (2016). Beyond Paralysis: The Reframing of Israeli Peace Activism Since the Second Intifada. Peace & Change, 41(3), pp. 354–385. doi:10.1111/pech.12162 .